Add this retro five piece dining table set to your home. The table features a round glass top and a unique, modern wood pedestal base. 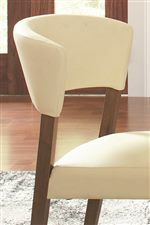 Meanwhile, the side chairs have a comfortable curved back and cream leatherette upholstered back and seat. The Paxton 12218 5 Piece Round Dining Table Set with Side Chairs by Coaster at Michael's Furniture Warehouse in the San Fernando & Los Angeles area. Product availability may vary. Contact us for the most current availability on this product. Add the retro Paxton collection to your dining space. This group features two glass dining tables - one rectangular and one round - with modern wood legs. You can also choose between two upholstered dining chairs - one in cream and one in grey. For a contemporary yet comfortable home, look no further than the Paxton Dining Collection. 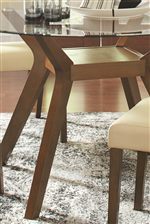 The Paxton 12218 collection is a great option if you are looking for furniture in the San Fernando & Los Angeles area.